All Treplus Communities offer spacious single-story apartment homes that incorporate Universal Design features for ease of access and outstanding aesthetics throughout. Additional features include no-step entries into the units, and no steps throughout the units. Surfaces are designed to be slip-resistant, and all units have wide interior doors and hallways. Features such as lever door handles and accessible light switches and electrical outlets create ease of use in every room. The master bath in each apartment has a no-step shower stall. Two-bedroom units have a tub/shower in the bathroom of the second bedroom. The bathrooms in Treplus apartments have towel bars that double as grab bars, and blocking is in place to provide additional support if needed. Grab bars are universal design features that enable residents to age in place more easily. Universal Design, as a discipline, focuses on accessibility and livability features with pleasing aesthetics, and it is a key element within Treplus Communities. This type of design creates a better quality of life for a wide range of individuals, regardless of age, ability or situation in life. Housing that incorporates all basic elements of Universal Design accessibility comprises less than 1% of all housing stock in the United States. Retrofitting older homes to Universal Design standards can be difficult, costly and yield unattractive results (think ramps). 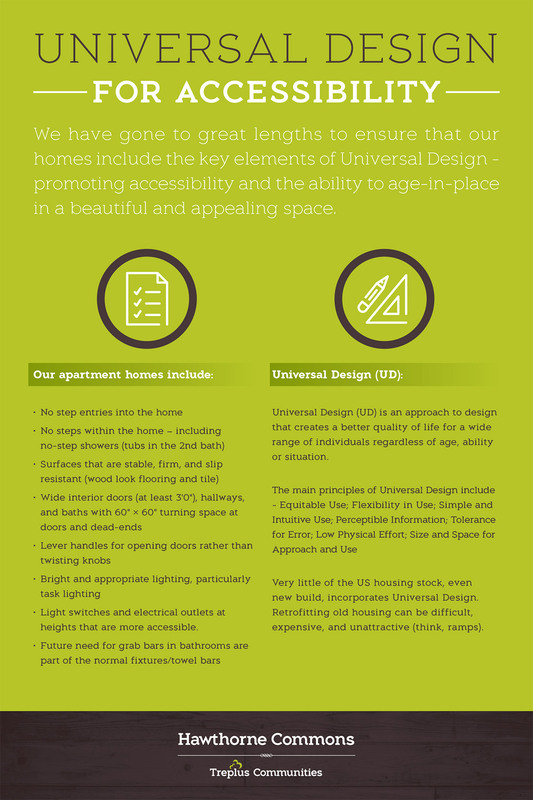 Treplus has gone to great lengths to make sure that all of its luxury apartments include all of the key elements of Universal Design. This promotes accessibility and makes aging in place easy within spaces that are also designed to be beautiful, spacious and contemporary. Light switches and electrical outlets at heights that are more accessible.